"Peace is but a shadow of death, desperate to forget its painful past…Though we hope for promising years. After shedding a thousand tears, yesterday's sorrow constantly nears. And while the moon still shines blue, by dawn, it will turn to scarlet hue!" Kuja was created by a sorcerer named Garland on a world known as Terra. Terra was a dying planet, and so Garland had plans to take over the neighboring world of Gaia, and sent Kuja as his dark messenger to prepare for that planet's downfall. Kuja chose to rebel, however, rather than be Garland's pawn, and tried to take Gaia for his own. He was foiled by his "brother," Zidane, another creation of Garland's. This "sibling" was the only of his race to ever have a normal childhood and youth, and so was very idealistic and good-hearted… and eventually prevailed. Kuja was defeated and fully expected that he would die… until he was pulled into the very mist which he had planned to use as a weapon against Gaia. When the mist cleared, his wounds were healed and he was in a new world: Arcadia. The curse of his own soul hanging over his head. Garland had created him to prematurely expire, and so he continues his quest for a permanent cure. Due to his extensive training, Kuja tends to be more reserved and less brash than many. Life has taught him the lesson of patience, and he is willing to wait for the right times to make his moves. He believes in getting to know a situation before running in blindly, preferring to know the lay of things before he enters into any endeavor. He tends to be openly skeptical of things that seem unlikely to him, yet at the same time, privately, he still believes that almost anything is possible. Kuja also has a certain level of fascination with this new world, which is so unlike his native Terra. If the opportunity presents itself, he may decide to observe a target rather than striking immediately. Combined with his ability to be patient, this makes him a very unconventional villain. Some might be the fire that strikes quickly and leaves only destruction in their wake. Kuja is most certainly not above causing mass destruction, but his style is much more careful. He would rather weave a subtle web of madness and chaos than just simply blow something up. Of course, if his plans end in a spectacular explosion, so much the better. Kuja has a decidedly mischievous side, though it may not surface all that often, or all that obviously. This is the part of him which delights in crafting his machinations just so, so that as his plans come into effect his victims will have that one final "joke on them." His idea of mischief manifests mostly in his love of crafting that one, final irony into the destruction of his foes. He very much believes in getting the job done… but will generally try to have as much fun with it as possible, in his own way at least. He can scarcely resist doing something with a bit more flair than is needed, having quite a sense of drama as well. He generally prefers to do things with a flair of theatricality. Kuja values appearances very highly. He has a definitely vain side, and behaves in a manner which somewhat belies the darker aspects of his personality. He is capable of being very polite and diplomatic, and prefers to act in an almost courtly manner at times. He knows that if people believe that you respect them, then they are more likely to go along with what you want. He will generally try to accomplish things through subtlety, rather than resort to outright violence or force. He can be very social when he wants to, and certainly displays nearly flawless etiquette in many situations. Kuja is not immoral. It would be far more true to say that he is "amoral." When Kuja finds something, or even someone, that he wants, he will go to any lengths to get it. Once he gets whatever he has been seeking, he becomes fiercely, even territorially protective of it. Having spent his entire life living on someone else's terms has made Kuja very jealously protective of anything he considers his own. Despite his usually genteel manner, Kuja is not a person to be trifled with. He puts up with little nonsense from people he dislikes, is very assertive, and generally is willing to do just about anything to get what he wants—ruthless is a good word for Kuja, though not heartless. In many ways, he's just someone who has never had his own things, or even his own life, before. Now that he has a chance for them, he wants to have all that he can get. No one ever taught him how to have anything before, so why would anyone have taught him how to know when enough is enough? Simple answer, no one did. As such, he is very prone to going too far with things. For all his careful planning, once he gets what he wants, he has a very hard time stopping. Consider a snowball, rolling down a hill. It begins very slowly, perhaps even as a single cautious snowflake. However, as it gets bigger and bigger and gains size and momentum, an avalanche can result. By that time, it's rather too late to stop it. He has a brother named Zidane Tribal. General Magic: From small cantrips to powerful offensive spells, Kuja is a master sorcerer. Illusion, enchantment, and teleportation are fairly common spells for him. He is naturally very resistant to magical attacks and unwanted effects, such as those that would normally "silence" a spellcaster or transform their physical body. White Magic: This allows Kuja to heal himself or others, purge ailments, increase a target's physical attributes or speed, or provide protective barriers against damage or entry. He can also use his white magic to create a "Holy" attack spell that will damage dark-aligned creatures. Levitation, telekinesis, and sensing the nature and condition of targets are all simple spells for him. Black Magic: Kuja can conjure fireballs, freezing ice, or lightning, even the potent firestorm he calls "Flare Star." He can also call upon the powers of darkness to attack and damage targets, often especially harmful to light-aligned foes. His powers also allow him to slow down or weaken his opponents, reducing their physical abilities or speed, to transmute living creatures or matter, or to compel targets with simple commands like "Sleep." Trance: Kuja can enter a state called "Trance" by sacrificing a portion of his life force. This increases his power many times over for up to hours at a time, but for each hour he spends in Trance form he will spend another hour recovering afterward, also losing a day off of his current life span. 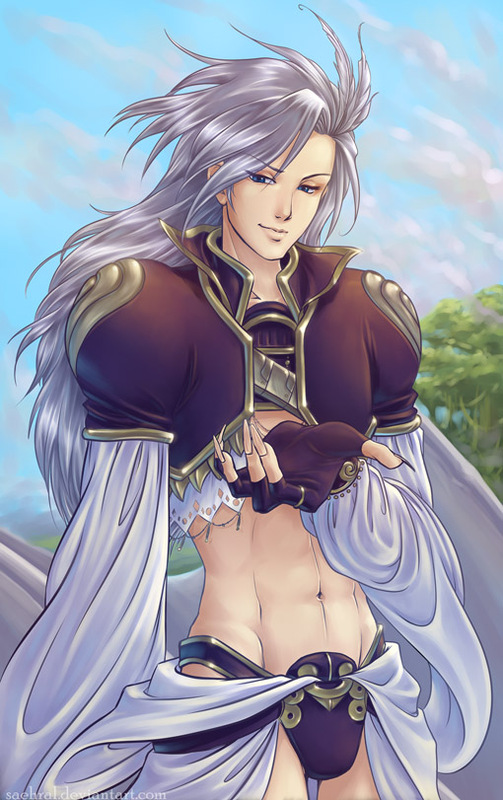 SKILLS: Kuja has a wide variety of knowledge about culture, art, and literature. He is also a very charismatic person, capable of being deceptive or manipulative or charming others into doing his will. Perhaps more than anything, he is a true master of mystic lore. Most of his actual magic abilities have focused on more practical purposes, but he has made an extensive study of alchemy, and what he cannot do with a spell he can generally do with a potion. Dying: Kuja's greatest flaw is that he's dying. At any given time, he generally has less than six months to live. This is due to a genetic flaw built into his body's DNA by his creator, Garland. Kuja is able to sustain himself, always pushing back the date and extending his lifespan, by using a variety of complex alchemical potions that he alone knows how to prepare. He devotes a great deal of his free time to seeking a more permanent cure for his condition. Physically Weak: Without his magic, Kuja is virtually harmless. He has absolutely no physical skills to defend himself, and he can hardly even lift a sword without cheating and using his magic to assist him. Mana: Kuja must be careful to draw steadily from the mana of the world around him to fuel his spells. If he draws too heavily too quickly, he may exhaust himself and render himself temporarily unable to cast magic or incapacitated. In his Trance form, because he is directly burning through his life force, he cannot run out of mana, but he can in theory drain away his own life force beyond recovery.